Compact, and yet extremely powerful, are the units of the planetary series. 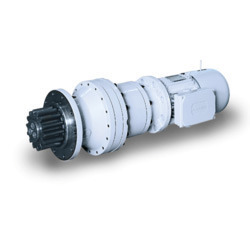 Their planetary drive train makes them the ideal choice for all the severe duty applications where shock loadings and impacts are more the rule than the exception. The product configuration is highly versatile, due to several options as far as the mounting, the gear layout, the output shaft and the motor interface. All the features are available for each of the 18 finely spaced frame sizes, spanning over the 1.000 - 1.400.000 Nm torque range. Finding the perfect match to any drive problem is therefore more than a wish, it is something users can safely rely on - always. Planetary Gearbox is a gear system consisting of one or more outer gears, or planet gears, revolving about a central, or sun gear. Typically, the planet gears are mounted on a movable arm or carrier which itself may rotate relative to the sun gear. Epicyclic gearing systems also incorporate the use of an outer ring gear or annulus, which meshes with the planet gears. Planetary gears (or epicyclic gears) are typically classified as simple and compound planetary gears. Simple planetary gears have one sun, one ring, one carrier, and one planet set. Compound planetary gears involve one or more of the following three types of structures: meshed-planet (there are at least two more planets in mesh with each other in each planet train), stepped-planet (there exists a shaft connection between two planets in each planet train), and multi-stage structures (the system contains two or more planet sets). Compared to simple planetary gears, compound planetary gears have the advantages of larger reduction ratio, higher torque-to-weight ratio, and more flexible con gurations.